The Relief Teacher: 3 things you HAVE to do on the first day back! 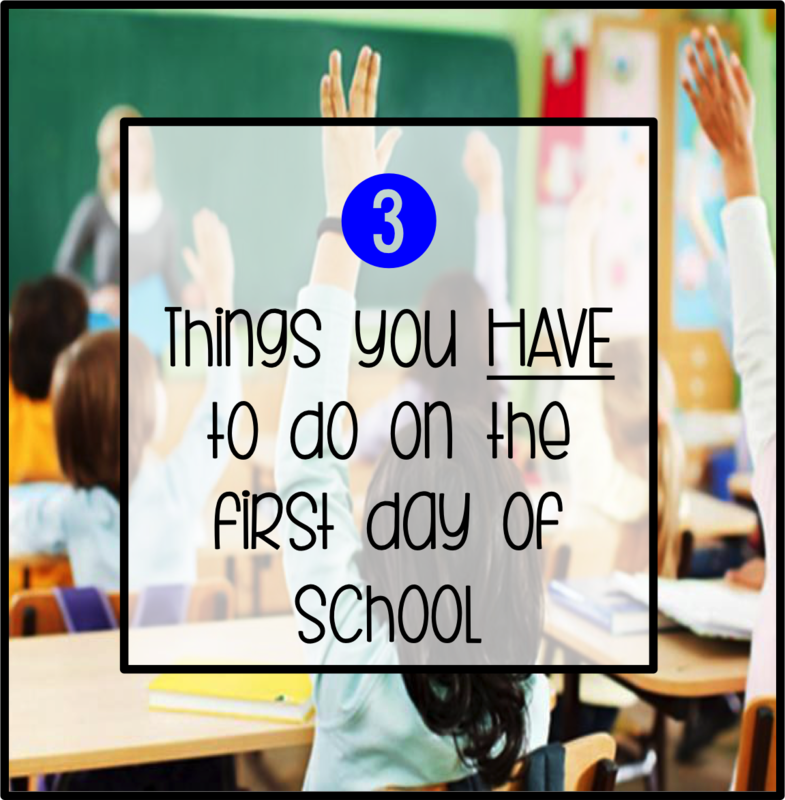 3 things you HAVE to do on the first day back! With a block lined up for the first few weeks of Term 1, I'm in a similar position to many other teachers and it's had me thinking, what do I do on the first day back? It's a daunting thought "going back", as you want to make the most of the first day, make a good impression and start the year off on a positive note. Although the students sitting in front of you may have met you before, or seen you around the school, these interactions are not always true to who you are as a classroom teacher. That's why it's important to start fresh and introduce yourself properly at the very beginning. When I introduce myself I always talk about my family, show a picture of my gorgeous puppy and talk about my favourite books. Students are often surprised to have a teacher talk so openly about their personal life, but this is so important in building rapport and mutual respect. At this time I also introduce the classroom, giving a brief tour of the the room and explaining daily procedures. The classroom tour provides a great lead in to discussing classroom expectations, as these are always displayed in the room. From the very start, students need to know the rules and consequences of good and bad behaviour, so including this explanation in your classroom tour allows a non-treatening introduction to your expectations during the 'honeymoon' period of the year. As the term progresses, you'll be glad you established your expectations early on as you can easily refer back to your rules and students have clear boundaries. Once students are familiar with you and the room it's time to allow students to get to know each other. The reality of our education system and classroom set up is that students spend a lot more time learning with and from their peers than with you, meaning positive student relationships are paramount. In light of this, it's important to provide students with an opportunity to get to know each other in a positive and well-structured environment, as we can't just expect students to get along from the beginning. Throughout the day, make learning all of your students' names a priority. Also endeavour to have a one-on-one conversation with all of your kids. Building positive relationships must begin on day one, as students will only be responsive to your teaching if they respect you and feel respected by you. 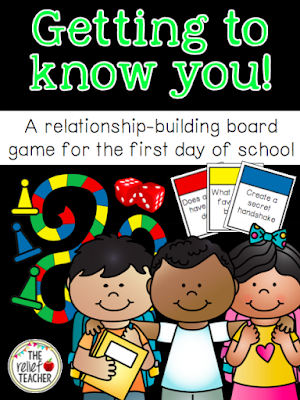 My top tip would be to move around the classroom as students are playing their get to know you game and listen to their answers and even join in! Well there you have it, my top 3 things you have to do on the first day of school. They may seem obvious, but in the chaos of being back at school you can be tempted to rush through these introductory basics. Now that I've thought these steps through I feel a lot better about getting started and the first day back is just that little bit less daunting! 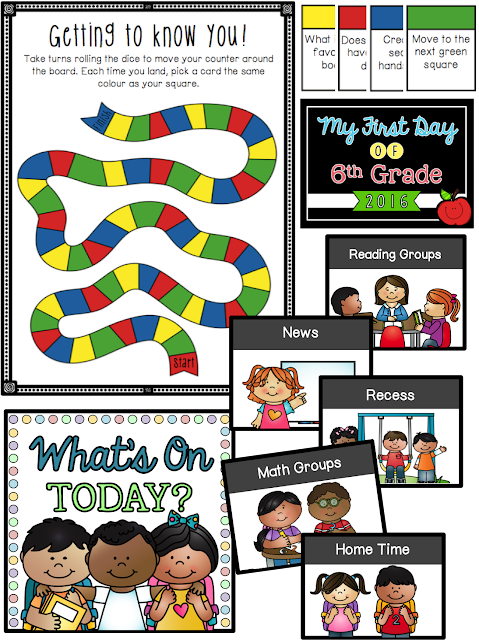 Now to start printing and laminating these resources for the 'before I go back to school rush!' Remember, if you see anything you like, head to my store! Book fairs - Dates for your diary! First week back? Bring it on!